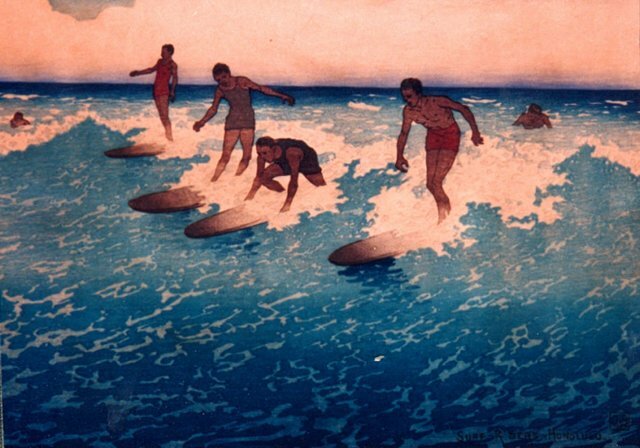 Charles Bartlett: Hawaii's Master Printmaker | Geringer Art, Ltd.
CHARLES W. BARTLETT (British, 1860-1940 in Hawaii). Charles Bartlett was born in Bridgeport, Dorsetshire, Enland. After enrolling in the Royal Academy in London he studied painting and etching. He then entered the private studio school Académie Julian in Paris. After his return to England in 1889 he married, but both his wife and infant son died in childbirth. He found solace in travel, and spent time in both Venice and Holland, where he discovered Japanese prints. Bartlett remarried in 1898, and with financial assistance from his wife’s family he travelled to Pakistan, Ceylon, Indonesia, China and Japan. Returning from Japan in 1917, where Charles executed woodblock prints, the Bartletts stopped in Hawaii and never left. Befriending Anna Rice Cooke, the founder of the Honolulu Academy of the Arts, Bartlett found a patron who advanced his career. Before his death in 1940 he helped found the Honolulu printmakers group along with John Melville Kelly and Huc-Mazelet Luquiens. faces of my new visitors). printed by wahooart.com, where I am a very good customer.